When a beginner starts solving a selfmate in more moves, he first tries to find out how the black could mate even if he wanted to cooperate. So, he in fact solves such a small helpmate. This happened to me with the selfmate fourmover in Bratislava, Slovakia, 2002, and thus the idea of sapomat was born. Se-he-mate is a selfmate and a helpmate in one problem (sapomat is an analogy in the Czech language). The position is the same in both problems, only the colour of all pieces must be changed. 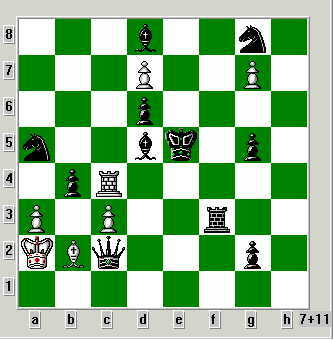 Thus, the same king is mated in both problems, only the pawns change their directions. Absolutely different constructions of self- and helpmates complicate possibilities how to bring contents into a sapomat. In spite of that the content was successfully brought in several problems: it is a formal theme, when solutions of self- and helpmates have the same order of moving pieces (a kind of analogy can be observed in the Balbo theme where values of pieces correspond). The author suggests to call it 'Ohrada theme' according to the place of origin. If the helpmate has more solutions, all of them must comply with the condition. 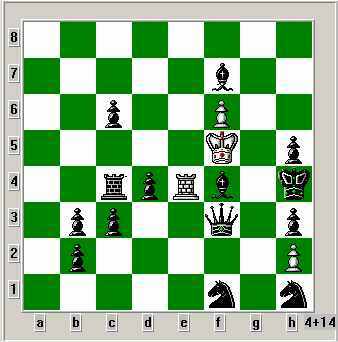 If a pawn is promoted into any piece, possible following moves of this piece are considered (for this theme purposes) moves of the original pawn. In case solutions of self- and helpmates have different number of moves, moving pieces must correspond in the number of moves of a shorter problem. they are two two-movers. Diagrams contain helpmate positions, before solving selfmates colours of all pieces must be inverted. In the solutions you can see that in all half-moves of self- and helpmates the same pieces move. This all is rather a kind of interest and recession, but it is still more or less an orthodox problem and the composer does not have to change the way of composing. Therefore, I'm opening a composition competition in the above theme in sapomat. There are no other conditions for the problems, fairy-pieces and fairy-conditions are allowed, self- and helpmates may differ as for the number of moves. The chief arbiter is Michal Dragoun, whom I'd like to thank a lot for all the previous and following help and support including a review and a translation of this article. The winners will definitely enjoy small prizes. Please send problems to: Lubomir Ursta, Drimlova 2513, 155 00, Praha 5, Czech Republic, or to: lubos.ursta@oracle.com, information about the competition can be found also on http://www.ursta.com/chess/problems/sapomat/intro_en.htm or simply www.ursta.com . The deadline is November 30th, 2003.